This Situation Update describes events occurring in Thandaunggyi Township, Toungoo District, during the period between March and July 2015, including healthcare and education challenges, ethnic discrimination, livelihood issues, military activity, and development projects. The healthcare sector in Thandaunggyi Township is underdeveloped since the Burma/Myanmar government healthcare department does not come to provide vaccines, especially in rural areas. The health workers also do not provide regular service to the villages to which they are assigned. Muslims who live in Thandaung Myo Thit Town, Thandaunggyi Township, are treated discriminately by the head of Thandaunggyi Township immigration department, U Myo Tint. Beginning in 2015 and as of July 2015, U Myo Tint has refused to grant Muslim resident Maung A--- the guest permission letter which is required for Maung A--- to be able to legally stay in the town overnight. The immigration officer U Myo Tint and the town administrator, also named U Myo Tint, continue to request that Maung A--- resubmit his household documents. Town administrator U Myo Tint also regularly comes to monitor Maung A---’s shop, and arbitrarily accuses him of breaking the law. 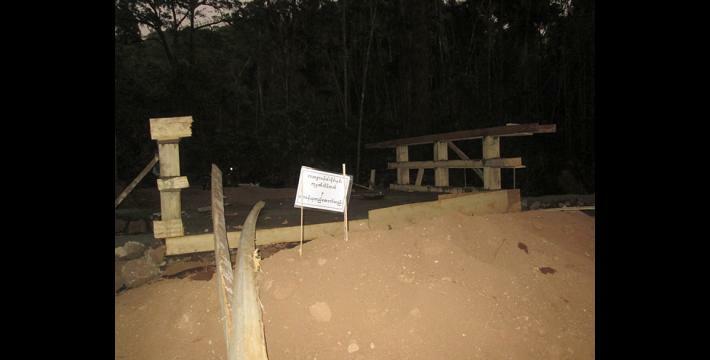 Following the signing of the 2012 preliminary ceasefire, some internally displaced persons (IDPs) went back and rebuilt their villages: Hpah Weh Doh Kah, Hpah Weh Doh Koh, and Thay Hpah Yoo villages, in Thandaunggyi Township. 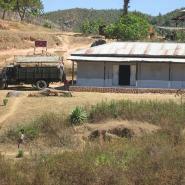 With the help of the Karen Education Department (KED), these IDPs built primary schools in their new villages. However, they have to hire the teachers with their own money, and due to having insufficient funds, they are only able to hire underqualified teachers. Mya Sein Yaung Company and their partner company lent 100,000 kyat (US $77.64) to poor households in Thandaunggyi Township. However, only those who could use their property as collateral to the company were able to take that loan. In 2015, U Man Day, the village head of Ywa Gyi village in Thandaunggyi Township, collected 2,000 kyats (US $1.54) per house for the cost of an electric generator which was given for free by Burma/Myanmar Ministry of Electric Power. When the villagers found out that they have been cheated, they complained to different levels of government, including the township, district, and national levels, in order to sue the village head U Man Day; however, no action has been taken against him. The following Situation Update was received by KHRG in July 2015. It was written by a community member in Toungoo District who has been trained by KHRG to monitor human rights conditions. It is presented below translated exactly as originally written, save for minor edits for clarity and security. This report was received along with other information from Toungoo District, including three incident reports, seven interviews, and 439 photographs. I am writing the situation update [for Toungoo District, the information in] which I collected between March and July 2015. This situation update covers healthcare, social [issues], education, livelihood, administration, military activity, and development projects. In Toungoo District, the villagers mostly suffer from diseases, which are malaria, flu, [excessive] flatulence and diarrhoea. The villagers from rural areas suffer from these diseases because [the Burma/Myanmar government] health department probably does not conduct education [about health]; it is also probably because of the development projects [that are still needed to develop the village]. The [Burma/Myanmar] government healthcare department does not come and bring vaccines into the small villages in the rural areas. The [Burma/Myanmar government] health workers do not go regularly to the village to which they are assigned [in order to take care of their patients]. In some villages, although the [government] health workers go to serve, they are faced with challenges in treating diseases since there is not [enough] medicine. The [healthcare] staff buy the medicines [with their own money] and they do [provide pharmaceutical services] as a business [through mark-up pricing]. The patients have to pay the cost of the medicine when they [health workers] treat their disease in the clinics or the hospitals. Therefore, [some people] treat their diseases at home with [the help of a] local villager who has knowledge about medicine, because they are facing financial difficulties. Since there is no free treatment for diseases in the clinics or the hospital, they [villagers] have to treat the diseases at home, or [with local health workers] through a debt [IOU] system as they have problems with money, but they still have to pay a lot of money [for the treatment]. In Maung Nwe Gyi village, the government health workers do not go and treat [prevent] the diseases, such as [by] giving vaccines to the children and mothers. Since they [children and mothers] are not being given vaccines, they experience unnecessary symptoms. In Thandaunggyi Township, Toungoo District, there were a total of 400 villagers who applied [to work] as nurses’ assistants, but only 20 villagers were accepted. In Thandaunggyi Township, Toungoo District, the ethnic groups have been living together and there was no discrimination between one another regarding ethnicity [in the past]. However, in 2015, the head of Thandaung [Thandaunggyi] Township immigration [department] U Myo Tint and Thandaung Myo Thit [town administrator, who is also named] U Myo Tint were working together, and since they do not want Muslims to come and stay in their area [Thaudaunggyi Township], they tried to find out their mistakes [weaknesses] in many different ways; [they] summoned them to come to the [immigration] office and threatened them. [The Muslim residents who were most affected were] Maung A--- and his siblings [who] live in the [Thandaung Myo Thit] Town. Beginning in 2015, Maung A--- was not given the “guest permission letter,” which is [the document required] to be able to sleep at night in the town. He has not been given it as of now. They [head of immigration department and the head of the town] mainly target Maung A--- [by not giving him permission to stay overnight], and later his siblings were also targeted. He was called by phone by immigration officer U Myo Tint, and he was asked to get [resubmit] Form No. 10. The town administrator [the other U Myo Tint] also often comes to check his shop and he also said that he is guilty [of breaking an unspecified law] and forced him to sign a promise document [that he will not “break the law” again]. 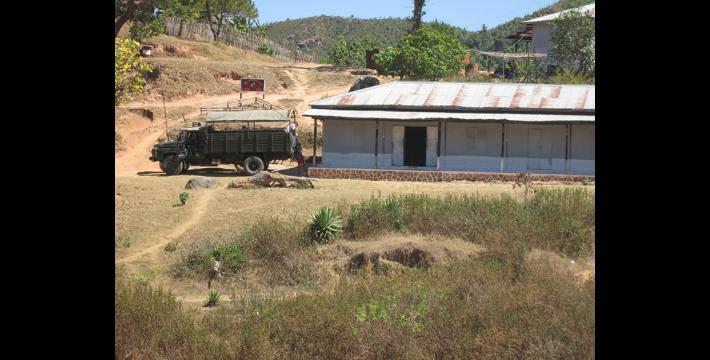 In terms of education in Toungoo Town, Thandaunggyi Township, Toungoo District, in the past, the Myanmar [Ministry of] Education practiced a system in which every student had to pass [their local school] exam every year. However, the government [Ministry of] Education started to change the education system in the 2014-2015 academic year, so that students in fourth standard and eighth standard [now have] to take the government exams while in previous years, the students in fourth and eight standards [only had to] take the [local] school exam. 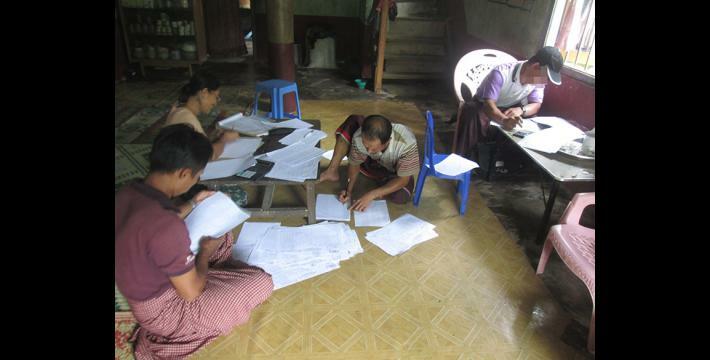 As a result, most students encountered difficulties [in passing their exams, as the Burma/Myanmar government standard exams are harder than the school-administered exams]. If the students failed the exam, the students were given opportunity to retake it; [if they passed the exam] then they continued to study, [moving up] to another grade. In the 2015-2016 academic year, although the students in primary school were given textbooks, notebooks and stationary, they [school supplies] are not enough [for all of them]. Therefore, [the students] had to buy [some school supplies] at the shop. This year [2015-2016 academic year], the students in primary school are given one school uniform set per student for free. There are also some students who are facing [financial] difficulties [preventing them from] going to school. In addition, tuition has been changed [and is now] called “extra class”. The students who attend the extra classes have to pay a fee each month. In the 2014-2015 academic year, the students who had failed ninth standard twice already couldn’t go to study at the school, even though they wanted to. They have to take [the Burma/Myanmar government] exams outside [through private classes]. Some students had to leave school because they could not continue their study, as they failed the exam. After the ceasefire, [some of] the villagers which have been IDPs [internally displaced persons] came back and rebuilt their villages. Since their children need to go to school, the villages in eastern Thauk Yay Kat river, Thandaunggyi Township, such as Hpah Weh Doh Kah, Hpah Weh Doh Koh, and Thay Yah Yoo villages, submitted a letter [to get permission to build the school] to KNU-KED [Karen National Union – Karen Education Department] office in Thandaunggyi Township, Toungoo District, so that their children [are able] to go to school. They were allowed to build a primary school [in the village, and] the students are supported [annually by KED] with some books [and] stationary. The villagers hired the teachers by themselves for their children to [be able to] study. Since they cannot hire teachers like the [Burma/Myanmar] government teachers, [whom the government] hires with a good salary; they can [only] hire those [villagers] who have not [even] passed the tenth standard or those who have [only] passed primary school. Some parents sent their children to the [Thandaung Myo Thit] Town to continue their studies [after completing primary school in the village]. Some students had to leave school since their parents could not afford to send them to school [in town]. Some students who went to attend the school in the town are facing problems with speaking [Burmese] language fluently, as well as the Karen language not being taught at school. The Karen language is not taught at the [Burma/Myanmar] government schools in Kayin State. There is no primary school in [some of] the villages such as Ta Pyay and Kywe Te villages, Kyauk Taing village tract, Thandaunggyi Township. Therefore, [the parents] sent their children to [the school] in Pya Sa Khan [village] as they want their children to study. Since it is [over] a mile between Pya Sa Khan [village] and their villages, the students face challenges as they have to travel [from home to school] daily. This year, in some places in Thandaunggyi Township, since it is very hot, the fruit trees that the villagers planted in their plantation did not produce much fruit. The cardamom plants that the villagers depended on [for their livelihood] have fallen down and were destroyed when it was windy because they were not strong enough, as the heat was very high. Therefore, World Food Programme came and conducted research [regarding this issue]. 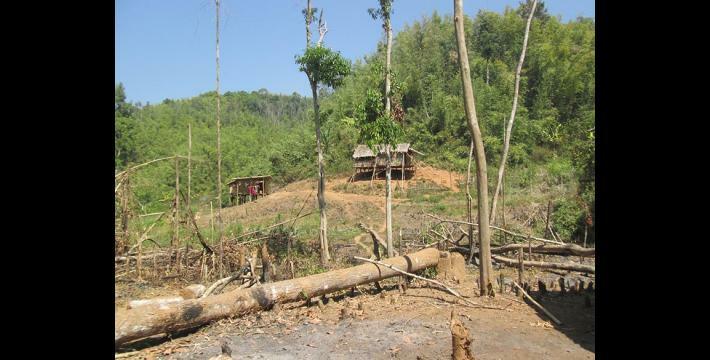 Since the plantations do not produce fruit in the rainy season, the villagers in Taw Pya Gyi, Shwe Nyaung Pin, Chaung Hna Khwa, and U Chit Kon villages have to find bamboo shoots and sell them [to earn an income]. A viss of bamboo shoot is 100 kyat (US $0.08). Although the money they got from selling the bamboo shoot does not cover [the needs] of their family, they have to keep doing it since they currently do not have any [other] work besides finding the bamboo shoot to sell. Chinese money lending [groups], which are Mya Sein Yaung and the [other group which is] cooperating [with them], lend money [to the villagers]. They lend 100,000 kyat (US $77.64) to each poor household. In order to take that money, the villagers need to show their house or house compound to be used as collateral. Those who cannot use their house or house compound as collateral are not allowed to borrow money; only those who own a lot of belongings are able to borrow money. There are also social [development] groups that came and shared their knowledge [about how their NGO came to provide assistance in the village]. On July 16th 2015, Myitta Foundation came into Nyein Chan Yay Kon [section], Pya Sa Khan [village, Thandaunggyi Township], and distributed one Big Tin (16 kg) and four Bowls (8 kg) of rice per household to a total number of 50 houses. Myitta Foundation is based in Yangon. The World Food Programme came and conducted a survey [regarding villagers’ livelihood strategies]. 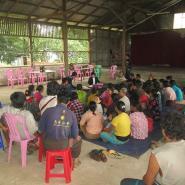 Karen Office of Relief and Development [KORD] also donated some money [to the villagers]. Regarding administration in Thandaunggyi Township, Toungoo District, since the village tract administration are supported [financially] by the [Burma/Myanmar] government and is under the control of the government, it is difficult for the civilians to feel protected [under this] administration. In order for the villagers to obtain an identification card, they need to get a permission letter from the village head. A Shwe Nyaung Pin villager in Thangaunggyi Township mentioned in an interview that he had difficulties getting his household documents [from the village head]. In 2015, U Man Day, the village head of Ywa Gyi village in Thandaunggyi Township collected 2,000 kyats (US $1.54) per house for distributing the electricity to the villagers. [The fee was] for [the cost] of an electric generator provided by the [Burma/Myanmar] government. When the villagers found out that the electric generator was given by Ministry of Electric Power for free and realised that U Man Day was cheating them, the villagers complained to different levels [of administration], which are the township level, district level and even to parliament [in Naypyidaw] to sue the village head U Man Day; however, he had no action taken [against him]. Since 50 villagers are required to be Special Police Force in each township, the village leaders are directed to recruit these people [by the Thandaunggyi Township Police Chief U Htway Oo]. Nevertheless, since the local villagers were not willing to serve [in the special police force], the village heads were called and scolded by the [Thandaunggyi] Township police [chief, after which they found people to sign up]. In Thandaunggyi Township, Toungoo District, the activity of the Tatmadaw is the same as before the ceasefire. The frontline army camps are repaired regularly. Rations and arms [for] military use were sent [to the frontline army camps]. The rations were sent to Thandaunggyi Town once a month [during this reporting period]. In addition, [the rations] were also sent to the [army camps in the] rural area [in Thandaunggyi Township] on a monthly basis. On March 25th 2015, Infantry Battalion (IB) #124, which is part of the 23 Battalions that are under the control of Southern Command Headquarters, had to choose three soldiers from the Battalion to be sent to Kokang area [in northeast Shan State]. These [three] soldiers had to be under 35 years of age and they also had to be single. On March 25th 2015, the soldiers were chosen by drawing lots. The three [selected] soldiers, including [a soldier named] Kyaw Khaing, left from their battalion’s [camp] on March 28th 2015 [and went to the battlefield in Kokang area]. On May 21st 2015 two of these soldiers died and Kyaw Khaing was injured. He was sent to the hospital, as he sustained a serious injury. Again, sergeant-level soldiers [from IB #124] were selected and Sergeant Kyaw Swa Win and another two unknown sergeants were selected. They were sent [to the battlefield in Kokang area]. 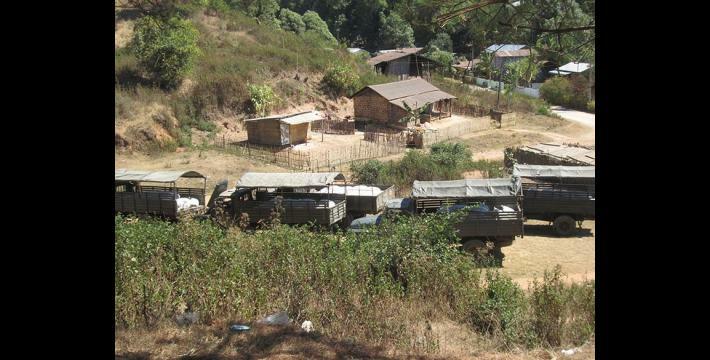 On April 23rd, 24th, and 25th 2015, a total of 30 military trucks which were carrying soldiers went to Thandaunggyi [Township], Toungoo District. On April 29th 2015, heavy weapons [were heard] firing loudly. On June 26th 2015, Light Infantry Battalions #439 and #599 had their rotation. In addition, since Bu Yin Naung Tat Myo [Tatmadaw] military training camp fires heavy weapons once [every] three months, [the heavy weapons shells] fall into the villager plantations [every time]. An incident happened: [A truck from] the truck column of Light Infantry Battalion #563, under the control of Military Operations Command #5, which was coming back from the frontline, collided with a motorcycle on July 11th 2015. Regarding the development [projects] in Thandaunggyi Township, Toungoo District, Chan Mya Way Si Company has been constructing roads and bridges. 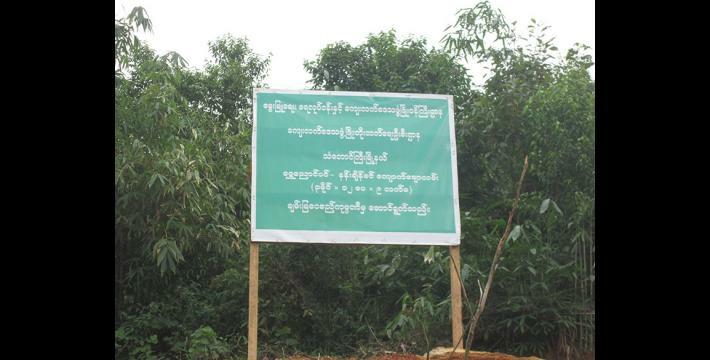 The road from Pya Sa Kan village to Thu Htay Kon village was constructed. 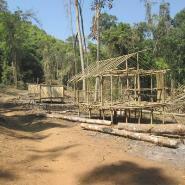 Buildings were built in the town on permission of the [Burma/Myanmar] government. 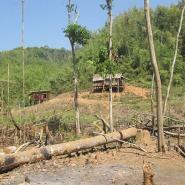 The road from Shwe Nyaung Pin village to Nan Chein Khwin village was paved with stones. 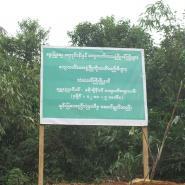 La Thitsa Pan Ka Maing Nin Company has constructed a road in Thandaunggyi Township, Toungoo District. 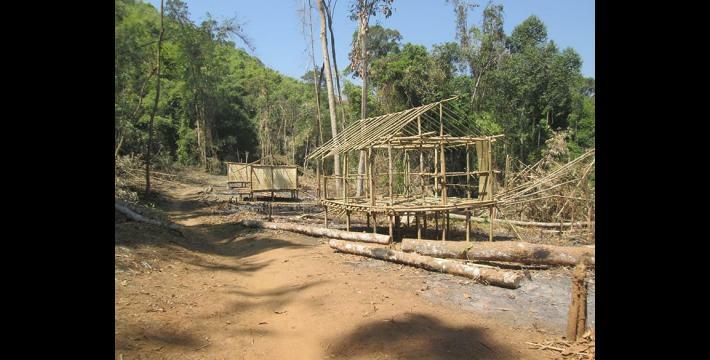 The road that La Thitsa Pan Ka Maing Nin Company constructed goes through Kywe Phyu Taung, Taw Pya Ka Lay, Ngwe Taung Gyi, and Bon Te Kon villages. In terms of healthcare, not only the [Burma/Myanmar] government healthcare department but also the KNU healthcare department have serious [genuine] concern for the civilians and supported [provided] the medicines [to the clinics, to promote] healthcare and give education [about healthcare] as much as they can. The healthcare [non-governmental] organisations also came and had a discussion with the civilians so the basic problem [of healthcare] has been solved. Therefore, the healthcare [condition] of the civilians can be developed [more in the future]. Not only government but also social relief organisations have been working together regarding the issues of education and healthcare, [as well as] social [issues], and livelihoods. The local authorities need to be the persons who really represent the civilians. The civilians’ representatives should be qualified and their good-will and compassion should be clean [untainted by greed]. They should also consider the needs of the civilians seriously. They should not look for their own benefit while working for the civilians. The development [projects that are chosen to be implemented] should basically come from the civilians’ opinions. Now, [the ideas of which] development [projects will be conducted] come from the [township] leaders’ opinions. Since the civilians are not involved [in discussions with the leaders regarding the development project, the resulting projects] do not benefit the civilians very much. What I mean is that if the civilians’ concerns are taken seriously, and [the development projects] which the civilians need [and want] are conducted, there will be better outcomes for the civilians. KHRG has previously received reports of religious discrimination against Muslims in Thandaung Myo Thit town by immigration officer U Myo Tint. See, “Toungoo Interview: Maung A---, April 2015,” KHRG, January 2016 and “Toungoo Situation Update: Thandaunggyi Township, January to February 2015,” KHRG, October 2015. Form No. 10 or “Household document” refers to a Burma/Myanmar government administrative form which all households must submit to their village heads or local authorities. This document includes the name, age, religion, and other demographic information of all the members of the household. According to the KHRG community member who submitted this report, although Maung A--- has still not been given permission to stay overnight in the town at the time of publication, U Saw Htoo, who is a member of a local group named Hsa Mu Htaw group, and USDP Chairman Saw Hay Tha Gyi told him he should continue staying in the town overnight and not worry. The two assured Maung A--- that they will handle any trouble he may be given by town administrator U Myo Tint or immigration officer U Myo Tint, since their charges against him are unfounded. In Burma/Myanmar, “tuition” usually refers to the fee students have to pay for after-school classes. Although these classes are not mandatory, students find that without them they are unable to pass their exams, as the quality of teaching in the free school lessons is poor. According to the KHRG researcher who submitted this Situation Update, this “tuition” has now been renamed and is referred to as an “extra class” fee. 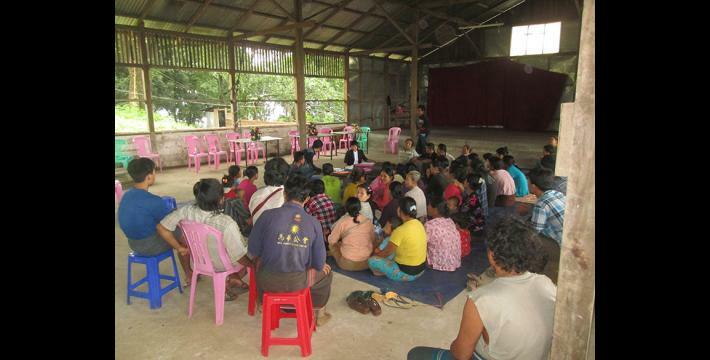 The KHRG community member is referring to the preliminary ceasefire agreement that was signed on January 12th 2012 between the KNU and Burma/Myanmar government in Hpa-an. For KHRG's analysis of changes in human rights conditions since the preliminary ceasefire, see Truce or Transition? Trends in human rights abuse and local response since the 2012 ceasefire, KHRG, May 2014. On October 15th 2015, after a negotiation process marred with controversy over the notable non-inclusion of several ethnic armed groups and on-going conflicts in ethnic regions, a Nationwide Ceasefire Agreement (NCA) was signed between the Burma/Myanmar government and eight of the fifteen ethnic armed groups originally invited to the negotiation table, including the KNU, see “Myanmar signs ceasefire with eight armed groups,” Reuters, October 15th 2015. A viss is a unit of weight equivalent to 1.6 kg or 3.52 lb. All conversion estimates for the kyat in this report are based on the January 29th 2016 official market rate of 1,296.58 kyat to the US $1. KHRG has previously published detailed information regarding the Mya Sein Yaung money lending project in Thandaunggyi Township. 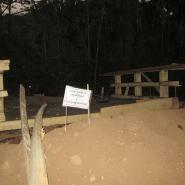 See, “Toungoo Situation Update: Thandaunggyi Township, April to June 2014,” KHRG, December 2014 and “Toungoo Field Report: December 2013 to December 2014,” KHRG, February 2016. A big tin is a unit of volume used to measure paddy, milled rice and seeds. One big tin is equivalent to 10.45 kg or 23.04 lb of paddy, and 16 kg or 35.2 lb of milled rice. A bowl is a unit of volume used to measure paddy, milled rice and seeds. One bowl is equivalent to 1.28 kg or 2.88 lb of paddy, and 2 kg or 4.4 lb of milled rice. A bowl is also equivalent to 2 mess tins, 8 milk tins, or 1/8 of a big tin. The Special Police Force were formed in order to assist with security at polling stations during the 2015 Burma/Myanmar general elections. According to a KHRG community member, following the election these Special Police were asked to report any new information that could be of interest to the police on an ongoing basis. If they fail to report on news from their area, they are subject to punishment by the police. Infantry Battalion (Tatmadaw) comprised of 500 soldiers. However, most Infantry Battalions in the Tatmadaw are under-strength with less than 200 soldiers. Primarily for garrison duty but sometimes used in offensive operations. 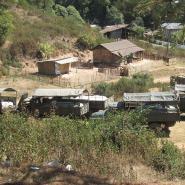 On February 9th 2015 fighting resumed between Burma/Myanmar government troops and ethnic Kokang soldiers belonging to the Myanmar National Democratic Alliance Army (MNDAA) in northeast Shan state. During the month of February 2015 alone, these clashes had left more than 100 people dead and caused around 100,000 refugees to flee across the border into China. For further information on the history of hostilities between the MNDAA and the Tatmadaw see, “Who Are Myanmar’s Kokang Rebels And What Are They Fighting For?” Radio Free Asia, February 23rd 2015. According to the KHRG community member who submitted this report, the motorcycle was being driven by a Tatmadaw soldier from Bu Yint Naung army camp. The soldier was severely injured during the collision and died later that day at Toungoo Hospital.